IEC 60364-4-41:2005+A1:2017 specifies essential requirements regarding protection against electric shock of persons and livestock. It deals also with the application and co-ordination of these requirements in relation to external influences. Requirements are also given for the application of additional protection in certain cases. 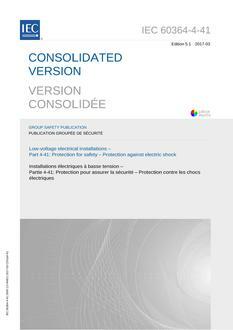 It has the status of a horizontal standard in accordance with IEC Guide 104. This consolidated version consists of the first edition (2005) and its amendment 1 (2017). Therefore, no need to order amendment in addition to this publication.